Not to get off topic, but is anyone casting in DCIH scale? Maybe I'm not looking in the right place, anybody have a link for Glassman? I tried Custom Justice but could not find one, only pics. Google Glassman Customs. His is the first one on the list. Be sure to cut the points off the top and bottom off the belt buckle. Quick question, I just ordered some of those cool looking casts from Stew (nothing painted). About how long does it take to get them made and shipped out? I'm not in a rush or anything, just looking for a genuine timeline. Thanks! i have been extremely busy lately but fear not. all orders are complete to date and are out the door for delivery. so i finally have a clear plate. not sure which order was yours but all went out at the same time. normally it only takes a day or 2 before i post but when orders are constantly coming in, sometimes things get a little slow because i try my best to go in order as i receive them. Awesome, I ordered a Volcana head cast plus a few other pieces and I can't wait to get it so i can try and put my own Volcana together, That figure has eluded me for far too long! Sorry! LOL. I didn't invent the thing; I was just being facetious. As far as the switch goes... It only works with "big buck" figures like Captain Atom, Orion, Kilowog and Bane. The other figures don't have enough room in the crotch area to accommodate the large peg of the Nightwing leg. Scarecrow uses a very thin buck, so I don't see how it could possibly work. If I were you, I would practice on a similar figure first. No need to ruin a perfectly good Scarecrow. I would also look at Rumble Ready Riddler as a possible alternative to Nightwing. His legs are thinner, and if the peg is too big, you can always modify it by making a casting of the leg. 2. Submerge figure for 2 to 3 minutes. 3. Pop the legs off. 5. With a screwdriver, you create a bit of separation, and then try to "pop in" one of the new legs. Then the other. 6. If you want the figure to maintain full motion and look "all professional"; then you'll need a Dremel Kit. For some reason, Mattel put "ridges" in the inside part of the crotch. So I used one of the small sanding heads to remove them, and another sanding tool to increase the diameter of the peg hole. This allowed for the legs to move better. Thanks very much for the detailed explanation! I didn't know about the peg/buck size and definitely need some practice before I try this though and better understand the popping in process. It definitely had me squinting at the "under seam" area of the Bane in your pictures for a good while. Is there anything that I should look out for in the process (like boiling) that might damage the figure? Is it easy to put back the original legs once you've taken them out? I hope I can accomplish this successfully. Skinny thighs don't bother me nearly as much as the height of Bane. He can go in one of the backrows, problem solved! Thanks for the idea about the riddler. I have him and his legs are super long and skinny. I'll definitely try this once I get a little bit more experience. another Q - has anyone tried to make JLU vixen more show accurate? I like the character alot, but her figure's face bothers me so much. Hey can anyone tell me when I go to Glassman's site why it does not fit on my screen? Is there anything that I should look out for in the process (like boiling) that might damage the figure? LOL, well... you don't boil the water with the figure in it! In this case, you boil water and after the water is hot, you submerge the figure "chest high". The buck and the legs are of 2 different types of plastic, so one gets hot and the other rubbery. The legs are the rubbery ones, and they become easy to mold, reset and/or pop. You can pop them by hand or with a "dull" screwdriver. (That is 'cause you don't want to risk damage with a sharp one). Is it easy to put back the original legs once you've taken them out? 1. Use the leg as is, in which case, the under seam will remain separated. 2. 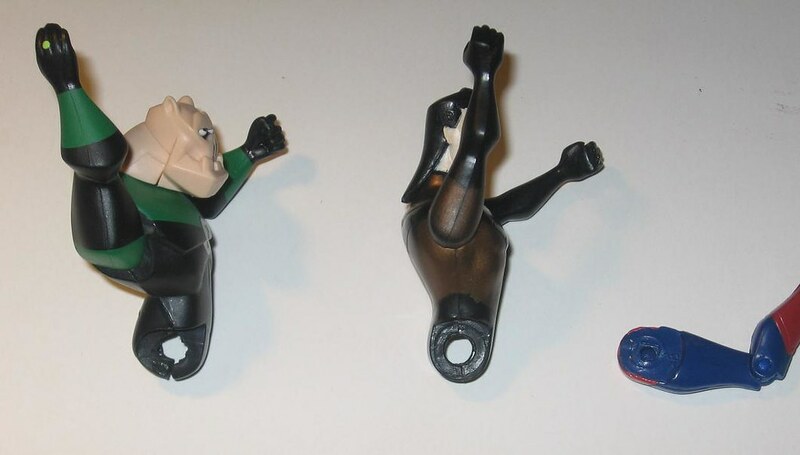 Use a sanding tool in order to match the diameter of Kilowog's peg hole to Nightwing's. If done correctly, the under seam will look "closed" even when the figure is placed in a sitting position. Skinny thighs don't bother me nearly as much as the height of Bane. He can go in one of the backrows, problem solved! I actually want Bane to have skinny legs!!! All my reference material shows him having skinny legs. He has them in the Batwoman DVD, Knight Time and Gotham Adventures. 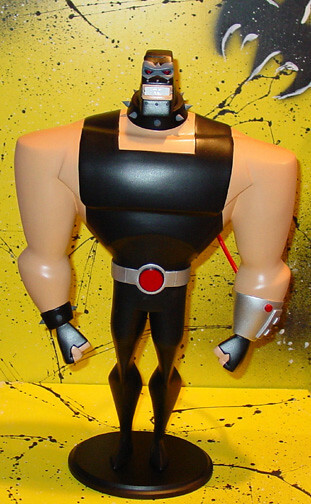 Casimir also went out of his way to give him skinny legs when he made his custom; and if you look at Cory Smith's Bane Maquette (pictured below), you'll also notice skinny legs. For me, it makes him different than KGBeast, as well as more show accurate. So I wouldn't change a thing. He is in fact, front and center in my collection. You could try repainting an extra Ice head from the Fire & Ice 3-pack. Ice is cheap and she would make Vixen look like Halle Berry. If you are good at sculpting, you could probably give her a new hair do. Does anyone have the dimensions to this Maquette? Thanks for the links, but they lead to the same page I had, and I cannot find on it anywhere where it says what he does commission or even how to contact him to ask. As far as contacting Glassman, the best ways are by PM at Custom Justice or by email at glassman6@hotmail.com.